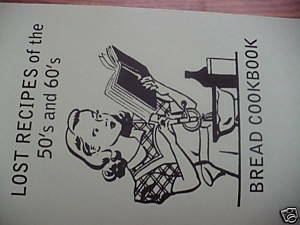 BREAD COOKBOOK Lost Recipes of the 50's And 60's!!! (YEAST BREADS) By:Amber I. A side note from the author says:What you WILL soon hold in your cuilnary hands are ACTUAL, HONEST TO GOD vintage recipes dating back to the 50�s and 60�s, taken directly from the extensive vault at Solar-Vision publishing which includes countless crumbling recipe cards, handwritten notes, clippings, journals � you name it, we�ve got it. I cannot help but to think that the people who originally collected these recipes and kept them all of those years would be THRILLED that all of the work that they did was coming to the culmination of this great book (One recipe collection we have contains thousands of recipes collected over about 40 years!!). This book is dedicated to the person or people who made its publication possible by painstakingly documenting these recipes over the last 50 years in the first place!YOU may be, perhaps, the first person to prepare these exact same recipes as they appear in this book in over 50 years. Think about that. That is why I have been so passionate about, and have been working so tirelessly to put this book together � it is that important to me, and I just know it is to you, too.Pardon us of the text is a little small, as we had to really squash the text down and increase the pages in order to fit ALL the YEAST BREAD recipes that we wanted into the book. And rest assured, WE WERE ABLE TO FIT THEM ALL IN! !--Amber I.